Antonio de Andrade is part of a capoeira revolution. Originally from Brazil, Andrade has spent the last ten years living in Lima, Peru, teaching capoeira to a dedicated group of practitioners. Representing the “Grupo Candeias”, he holds session on the third floor of a fitness center in the Jesus Maria district of the city. The emergence of the Peruvian chapter is a small representation in the global proliferation of the sport. Capoeira traces its roots back to the 16th century when African slaves were imported from their homeland to work the sugar cane fields in Brazil. A mix of fight, dance and complex acrobatics, the fighting-style was developed and later disguised as a dance ritual so that slaves could develop their fighting ability undetected by the Portuguese colonists. The purpose, as popularly believed, was to arm unarmed slaves and give them a way of defending themselves should the day come when they made way for escape. Because of this, capoeira has historically gone under routine discrimination as being “a fighting style of slaves” and doesn’t hold the same heir of noble tradition as say its fighting counterparts of jiu jitsu or boxing. The social stigmas of capoeira are many. First is its association with slavery, and later with criminal gangs that emerged in Rio de Janeiro during the late 1800s. It is therefore important to realign, but not necessarily forget, its historical origins. Retaining the roots is important because it represents a strong lineage in resistance and striving for freedom, but what needs to be shifted is the presumption that the art’s conception under desperate measure and little means somehow implies that the practice is unorganized or underdeveloped. While it is true that as a whole capoeira has a more relaxed and improvised air to its practice, it does also hold a firm routine of techniques, established rituals and a fully organized belt system within each group. Thus, the misconceptions perhaps speak to a larger societal bias in devaluing any cultural artifact developed through slavery, though part of the recent extrapolation of the sport, as seen with the Candeias group, is aimed at combating that. Capoeira is an art of minimal means. Apart from a few instruments, there really isn’t much equipment required for someone to practice. No bags, gloves, or complex uniforms are involved and a housing structure isn’t necessarily required as one could literally do it in a dirt field. This allows virtually anyone to take part in any terrain coming from any place. Because of that, a related stigma is the belief that capoeira remains a practice of the lower socio-economic classes, another hurdle of discrimination that Saletan touched upon earlier. According to Andrade, however, his intention is to bridge the social gaps in society. “In the last five years there’s been a huge change in the acceptance of capoeira. In terms of the social means, it started with people of very low socio-economic levels, but today people of all social classes are doing capoeira, and this is our intention: to bring capoeira to the general mass, independent of social level,” says Andrade. Beyond the socio-economic stigmas, another challenge is defining its efficiency in combat situations as many wonder if Capoeira is a legitimate marital art. Apart from a few international events, there is no consolidated capoeira league that holds publicized competitions, nor is the sport really rooted in bettering another practitioner. Perhaps this lack of regularly visible competition and ranked champions causes doubt for its stake in its fighting legitimacy, and the only glimpses of its applicability are seen in snippets weaved into mixed martial arts. Few current MMA fighters carry the practice as part of their arsenal, but a handful of combatants have in the past. From Marcus Aurélio to Jean Silva to even the legendary Anderson Silva listing capoeira as one of his base martial arts, the sport has been used for in combat competition for quite some time. Many fans and experts denote its efficacy from the constant use of wide kicks and large movements, but Andrade believes whole-heartedly in its legitimacy. 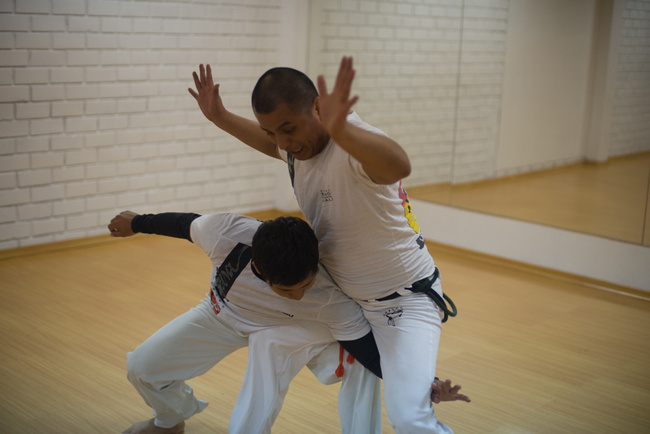 Much of Andrade’s approach to his Peruvian students is implementing this outlook into his teaching as he hopes for his students to represent the sport in any combat arena. While he is aware that the flashy flips and spins is what initially draw students to signing up, his goal is to cultivate more socially conscious fighters. Finally, capoeira is also contending for its stake in cultural legitimacy. From its beginnings, capoeira was largely shielded from the public eye, again due to its association with slavery, the lower socio-economic classes, and crime. In 1892 it was outlawed throughout the country and not reinstated until over 40 years later in 1937. It took another 37 years for the practice to be recognized as a national sport and it was only this last November that it finally earned a cultural heritage status from the UN. This exclusion speaks to a larger issue of how Afro-Brazilian culture has been largely kept out of the cultural collective in Brazil, and how its mere existence is a representation of changing public consciousness. When you tie in everything from its conceptions to its evolution to even the symbolism behind the moves and ritual, you begin to see that capoeira in itself is a physical manifestation of the country’s history. The exclusion of Afro-Brazilian culture and history holds repercussions in the present. They say that there is a Ferguson everyday in Brazil, that black youth are harassed, persecuted and at times killed due to the societal perception of Afro-Brazilians based on the country’s complex history of slavery and its evolution afterward. Having read many articles on the matter and bearing witness to such examples when living there, there is certainly some truth to that statement. In large part, the treatment is due to a broken understanding on race and class, and participating in a sport like capoeira sheds more light upon topics once shadowed in misunderstanding. While people are drawn in for different reasons, shaping oneself into a better person seems to be a common result. So is capoeira a dance, a fight or a cultural ritual? In truth, it is all three, and it seems that one of its many purposes is to bring greater awareness to Brazil’s historical struggles to those seeking improvement of their body, mind and spirit, as many find when participating in martial arts. 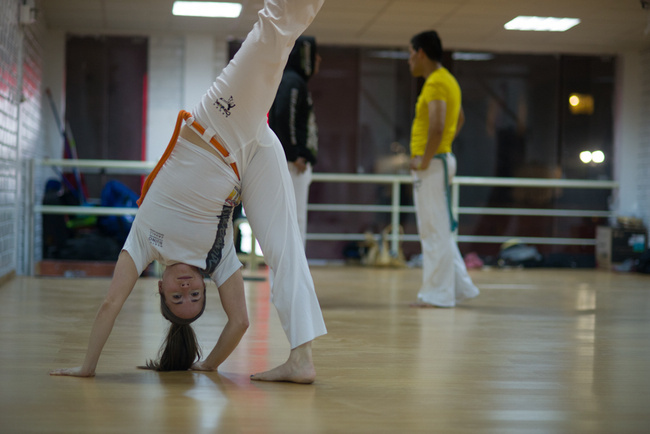 The presence of the Candeias Group in Lima is then perhaps an example of how capoeira and martial arts can be used as vehicle for social change. What I saw that day was a group of people dedicated to learning an art and culture not their own, and through that pursuit they learned more about tolerance, about the understanding of others and themselves. The fact that it emerged from something as horrendous and oppressive as slavery makes it all the more powerful.